Anyone who’s read the principles of motivation will recognise the pyramid, Maslow’s hierarchy of needs. This management theory is seventy years old this year, and the BBC website has produced an interesting article on the theory and its creator; including how it’s applied to business. I’ve studied Maslow a number of times and the article got me thinking about Maslow and the Micro Business. What does the hierarchy of needs mean for a sole trader; or a micro company of one or two people; like us! The concepts of team, manager, promotion and self-development look very different in these organisations. At the bottom of the pyramid are physiological needs, in Maslow terms this is the need for food, drink and shelter. In Micro Maslow, I see this as paying yourself a reasonable salary. If you’re not paying yourself, then you have a hobby and not a business. Next level is safety. For Micro-Maslow I equate this to longer term contracts and future cashflows, rather than not knowing where your next influx of money is coming from. Once you get to here, you have a good foundation for growing the business. Maslow’s middle level is love and belonging. This is important for micro businesses, as the lack of people means it can be a solitary working life; the solution is networking. You need to meet, talk and discuss with people working in your field or other micro business owners. This might be through on-line forums, trade/industry organisations, local chamber of commerce or business owners meetings. 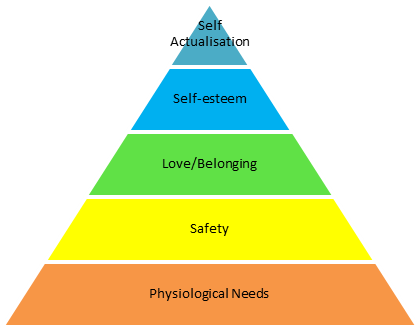 Moving towards the top of the pyramid is self-esteem, which Maslow describes as reputation and status. For Micro Maslow there are two sides to this. The external side is about getting your name known; give talks or presentations, speak or volunteer at industry events and get recognised as an expert by others in your industry. The internal side is about appreciating your own achievements. We’re not very good at taking a step back and congratulating ourselves on what we’ve done. Have you achieved your targets for the year? Has your business grown? Have you remained profitable? Recognise what you have achieved and congratulate yourself! Maslow’s peak is self-actualization, realising your own potential. For Micro Maslow this is about achieving your business dreams – and remember it’s your dreams! It might be achieving a certain level of turnover or profit, providing a certain personal income level, creating jobs, giving back to the local community or achieving the work life balance you want or something else. What’s your business dream and have you made it come true? Putting my thoughts together gives me this Micro Business version of Maslow. In writing this blog, I’ve identified a few areas we need to work on. What about you? Where are you on the hierarchy? Any level you need to work on? Have you achieved your business dream? This entry was posted in Business Innovation, Growth and tagged Business, Growth, Maslow by Andy. Bookmark the permalink.